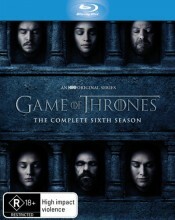 The Game Of Thrones season 6 Blu Ray is HBO's epic series based on George R.R. Martin's bestselling book series and now it returns for season 6 for new a new season of duplicity and treachery, nobility and honor, conquest and triumph. A storm is coming. Click the button below to add the GAME OF THRONES - COMPLETE SEASON 6 (BLU RAY) to your wish list.